You are the author of a work of art (painting, sculpture ...) and you want to identify this work and claim its authorship. 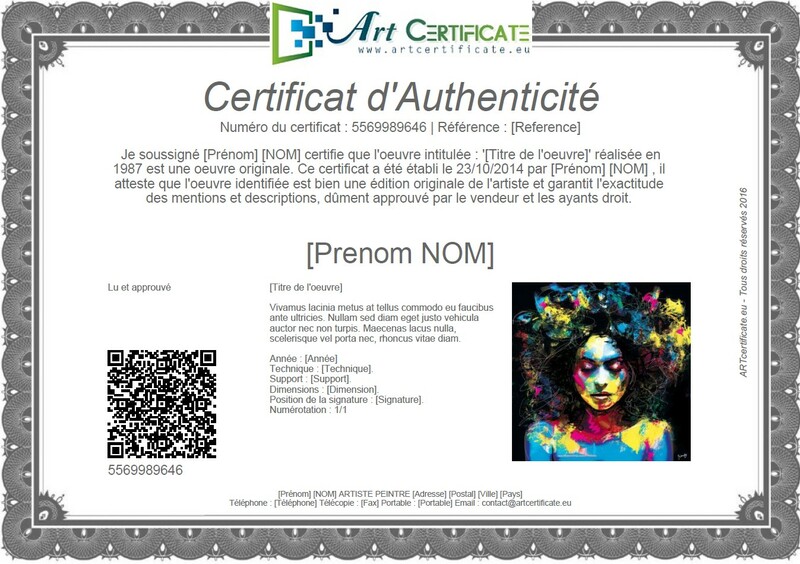 You will sign this certificate of authenticity and send it to the buyer of your work. Certifies that the work designated below is the original and a single piece. There are no predefined dimensions for such a certificate of authenticity, so printing on A4 sheet will do the trick. But free to you to be imaginative. - To better preserve this certificate of authenticity, print it on thick paper or plastify it. - Do not specify the name of the purchaser, in order to facilitate the resale of your work.